Trends tend to come and go, but quality design components that are sustainable and low maintenance never go out of style. Knowing the timeless elements of design is important to the foundation of any landscape project, but using ideas from outside-the-box will always increase your design’s special and unique qualities. Aesthetically pleasing landscape design typically aligns with the style of a home’s exterior, but undoubtedly there are ways to add nuances that can create a sense of intrigue or illicit specific feelings, like relaxation, in your space. 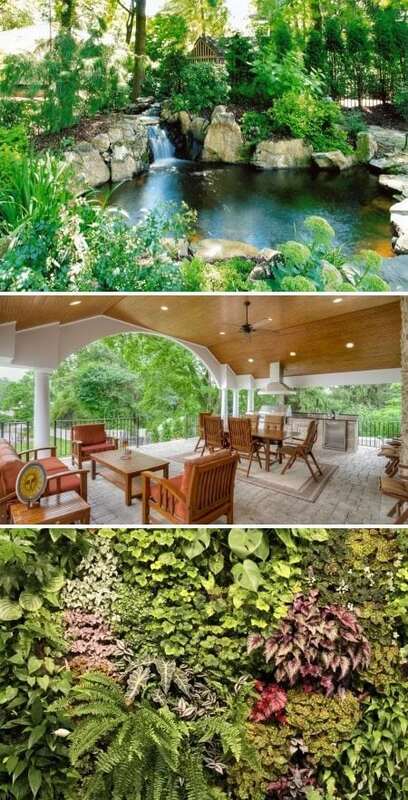 Luckily, outdoor living trends for 2016 include elements of enduring classics such as functionality and gardens as well as features that lean toward the recent boom of bringing interior amenities to the outdoors. Mimic the indoors in your outdoor space this season by incorporating a pavilion or pergola. Create a space outdoors where you can enjoy time out of the sun or rain. Outdoor furniture fabrics have come a long way in the past few years. Many brands that use acrylic fabrics are waterproof and fade resistant from the sun. Outdoor furniture has become a staple in most homes, but this year’s trends lend themselves to comfort and more time relaxing time outside. Customized built-in televisions and surround sound systems that include the entire yard will be installed in many outdoor living areas this year to aid in family fun and entertainment. Another hot-ticket item will be projectors for backyard movie nights on a big screen! Deep seating with soft cushions around a fire is definitely one of this year’s hottest trends. Create an outdoor hearth this summer and you will be able to cook on an open flame, keep bugs at bay and use your space throughout more of the year. At this point, so many people are enjoying outdoor living that even showering or taking a bath outside have become trendy. Aside from outdoor showers having a “naturalistic luxury”, they are a great way to rinse off after gardening, swimming in the pool or after lying in the sun. The consensus, this season, is that homeowners want better quality and less “bling”. Low maintenance designs are key along with convenience and control. Programs and applications that govern lighting, pools/spas and security are being installed in many homes to afford control and protection while homeowner’s are away. Homeowner’s can check security cameras, turn on lights, and saunas or spas with just a click. Extend your Wi-Fi throughout you landscape this season and allow your family and guests to be a part of the fun in your outdoor living space even if they have to “stay connected”. Annually, the New Jersey Nursery and Landscape Association, NJNLA, reviews entries sent in by Landscape Designers and Architects from all over New Jersey and honors the top designs with its prestigious award of superior excellence. 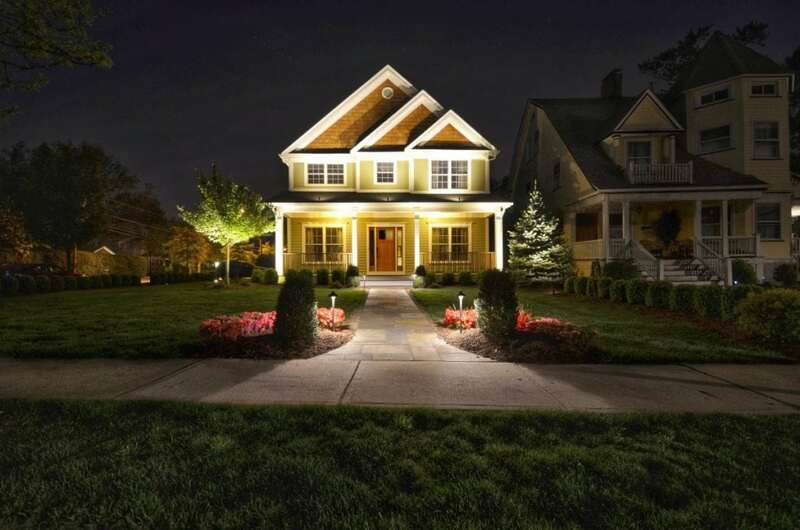 This year Sponzilli has been honored with the award for superior excellence in residential design for the design and installation of an outdoor living space in North Caldwell, NJ. 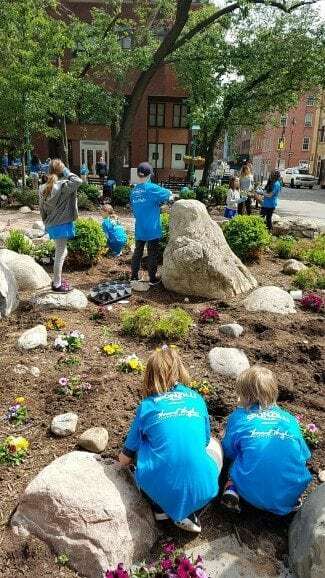 The Titanic Park Beautification event with Sponzilli Landscape Group and the Blue School was sponsored by The Howard Hughes Corporation in a continued push to support the local community near the South Street Seaport area of NYC. Our efforts to work with the Blue School to educate students about plants and their importance in urban settings enhanced this memorable experience of working with the community to create an inviting outdoor space for all to share! 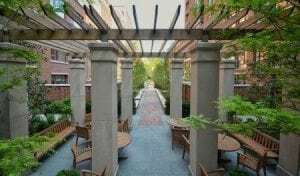 Project Description: The WVR project includes a series of beautifully designed Landmark Buildings at the former St. Vincent’s Hospital site in Greenwich Village. 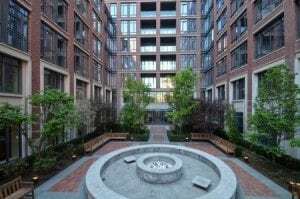 The “Residences” and other buildings boast pre-certification by the US Green Building Council as New York City’s first LEED Gold Residential Development. This project exemplifies the green and sustainable opportunities developers and designers have to provide magnificent and amiable green spaces in large scale urban projects. Sponzilli Landscape Group provided installation of the central, landscaped courtyard and gardens that include an inviting landscaping, green commons spaces, beautiful plantings, over 100 trees, formal gardens and even a marble fountain with a unique reflecting pool. During the summer of 2015, this expansive property upgraded its outdoor living area by adding a spacious raised terrace to connect the two modes of egress from the home. 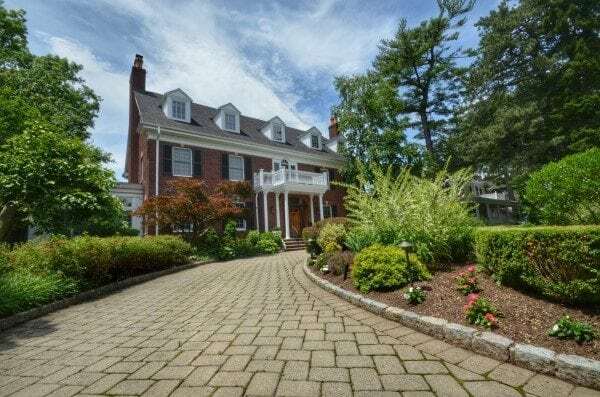 Since the home has a classic Georgian style, the raised terrace was built using brick to match the home, along with bluestone accents and design patterns throughout for added detail. The entire terrace was surrounded by raised walls to provide ample seating for dining, or use of the natural gas fire pit. In early spring 2016, the homeowners decided to upgrade their space again by adding to their outdoor entertaining area and incorporating a large rough concrete shelled pool. A mini excavator was used to dig an underground drywell with solid PVC drain pipes which were connected to the home’s downspouts. The excavator was also utilized to design a low wall near the pool, made of large boulders. Colorful lush greenery and flowers were planted throughout the landscape to create a ‘Stand Apart’ look. April’s issue of The Best of Morris/Essex Health & Life Magazine gives some of the best insight into the top businesses throughout the area. In early 2016 readers were asked to share and vote on the places they believe provide the highest quality, service and commitment to their clients in the Morris-Essex area. The voting section did not have a Landscape Design category but that did not deter our loyal clients! Sponzilli was voted for by so many people in the “write in” section of the ballet that we won the READER’S CHOICE AWARD! 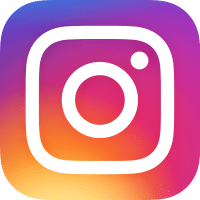 We are now on Instagram! Follow us @sponzillilandscape to find out more information about our current projects that are happening NOW throughout NYC and NJ. Sponzilli Landscape Group strives to connect with our clients and build lasting relationships. Follow Sponzilli Landscape Group on Facebook for landscape inspiration and the top trends in outdoor design.